Do you sell any spray foams?. What will I need to use the foam? What are the differences between the foam densities? How much time do I have to pour the foam? Can I use multiple pours for large jobs? Will the foam blow out the walls of my mold or cavity when it is expanding? I want to release this foam from a mold what should I do? Can I dissolve this foam once it has fully cured? How can I make sure to get good expansion when working with the foam? Can I use the foam outdoors? Is this foam completely water resistant? Which density is used for flotation in the bottom of a boat? How much foam will I need to fill my pontoon? Can I fill a pipe with the foam? Can I use this foam for making decoys? Is there a hazardous material shipping fee? Do you sell equipment to spray your foams? While people do use our foam for spray applications it isn't really our specialty and we do not sell any spraying equipment. We can probably save you some money on the foam once you get going though! You will need containers to measure and mix the foam and stir sticks to mix the two parts together. Gloves and eye protection are strongly recommended. This product will out gas carbon dioxide when expanding so for safety you should always work outdoors or in a well ventilated area. You can use a solvent such as acetone, denatured alcohol or lacquer thinner to clean up when the product is still liquid, however urethane foams will stick to virtually everything except slick plastics so you should cover-up anything you do not want the foam to damage. 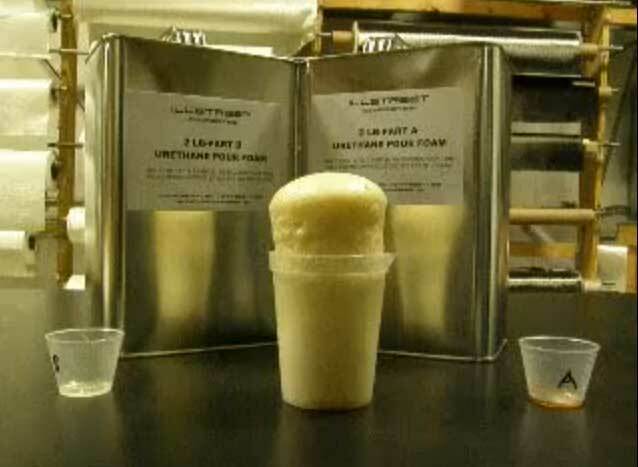 Our urethane foam is a two part, pour in place liquid that when combined and mixed thoroughly will expand into a rigid, closed cell polyurethane foam? The densities of the foam refer to the weight of the foam when cured per cubic foot (12" x 12" x 12"). Higher densities will result in a heavier foam which is also stronger. We have listed brief examples of hardness and physical properties to help you select the correct density here. Please also be aware that as you increase in density your expansion ratio will decrease, resulting in a higher cost per cubic foot of cured foam. Example 24 inches x 24 inches x 48 inches = 27,648 CUBIC INCHES. Now to convert to cubic feet you much divide that number by 1,728 which equals 16 CUBIC FEET. See FAQ question 10 to determine volume on a cylindrical type shape such a pontoon. After you have combined the two components you have approximately 45 seconds before the foaming process begins. We recommend that you stir the liquids vigorously for 25 seconds, after which time you have another 20 seconds to pour the foam into place. The foam will fully expand in 5 minutes and be fairly hard in about 15 minutes. Yes, this foam can be poured in layers. For best adhesion you should wait at least 15 to 20 minutes before pouring over a previous batch. The foam does exert pressure while it is expanding, however it flows to the path of least resistance. So long as your cavity/mold has one side unrestrained for the foam to expand to then you will not see any distortion of your cavity walls. If your cavity/mold is completely closed with only a small vent or pour hole to access we recommend pouring the foam in small batches so that you do not overfill your cavity and risk putting pressure on the walls. Wait approximately 20 minutes before pouring in the next batch of foam. There are instances where multiple pours are not possible, in these cases you must do as much calculating as possible beforehard to determine the volume of your cavity and mix up no more than 10% extra foam than what your cavity will hold. Well if your mold is made from something already smooth such as a plastic, metal or fiberglass than you can normally use our mold release called Partall # 2 paste wax found here. This product is applied like a car wax. Multiple coats should be applied to new molds. The more coats you apply and the better you buff the wax between each coat the easier the foam will release. For porous molds such as wood or plaster these should first be sealed with either a lacquer, polyurethane or shellac in order to create a smooth surface in which to work. Then you can apply the Partall paste wax as described above. No. This foam is designed to be completely solvent resistant once cured. Gasoline and acetone will not cause any destruction of this foam. Please prepare ahead of time by covering any objects/areas that you do not want to come in contact with this highly adhesive product. If you do happen to spill some foam and it cures you will have to either sand or scrape the product away. The two things that are most important to achieving good foam expansion are as follows. 1. Temperature. If working below 80 degrees F you will notice a slight reduction in expansion. If trying to work in 40 to 50 degree weather you will be lucky to get half the ideal expansion. Try to work in a heated area, the liquids are not considered flammable so you can use a heater nearby. Also be sure to warm up the product before use to at least 80 degrees, either by storing in a heated room or by submerging the containers in a bucket or warm water. If you're already working in warm conditions these temperature precautions are probably unnecessary. 2. Mixing Quality. The two liquid components should always be stirred together for at least 25 seconds as vigorously as possible before pouring. If working with more than 1 gallon at a time a high speed drill mixer would be a good idea. If you try to mix 2 gallons of liquid together with just a stir stick you will not get a good enough mix resulting in a flawed chemical reaction with reduced expansion. Try working in smaller liquid quantities and pouring the product in layers approximately 15 to 20 minutes in-between. Yes. Our expansion rate of the foam is based on temperatures of 80 degrees F at moderate humidity. When using this foam in temperatures below 80 F you will see a reduction in expansion. At 50 degrees F you would probably only get half the normal expansion. For using the product during winter months it is ideal to work in a heated garage/shop in which you can get the product temperature and air temperature up to about 80 F.
Is this foam water resistant? Yes, but with the following caveat. The foams that we sell are considered closed-cell, which means that each cell that makes up the foam structure is completely closed off from surrounding cells which prevents it from acting like a sponge. It is completely safe for this foam to be in contact with water for hours/days/weeks and even months with no adverse effects. However, it should never be submerged in contact with water permanently. Over a period of years the water contact can begin to soften the foam and cause it to lose its closed-cell status. This foam is designed primarily to be used as an insurance policy in case of damage/holes that could cause a vessel to lose buoyancy. Pinhole sized openings would essentially have no effect on the foam since the amount of exposure is so minimal but you should always make repairs as soon as possible to keep the foam effectiveness as good as possible. This will be the case with all after market closed-cell polyurethane foams and even manufacturer installed foams. Our 2LB foam is generally used for most marine flotation requirements due to its good flotation properties of approx. 60 lbs of buoyancy per cubic foot. For flotation applications requiring some structural elements such as helping to support your deck or strengthening between stringers or bulkheads we would recommend using our 4LB density foam, which is also appropriate for filling around gas tanks. In order to calculate the volume of a cylinder shape you must have the diameter of the pontoon(measurement from side to side) and the total length of the pontoon. First convert everything to inches. 18 in diam. x 168 inches long. Since most pontoons are round we need the determine the area of this round part. Area is radius squared times pi (3.14). We know that an 18" diameter is a 9" radius. Now we multiple the area by the length. Lastly we convert that to cubic feet. 42,672 divided by 1,728 = 24.69 cubic feet of total space to fill. This might not be an exact science since not all pontoons are completely round and usually they taper to each side, but this will give you a good starting point. The answer would depend on the diameter and distance of the pipe. A 1 foot diamater, 3 foot long pipe would be no problem. A 1 inch diameter, 20 foot long pipe would be impossible. Since the foam only remains liquid for about 45 seconds, it can only flow approximately 5 feet before it starts to gel and expand. When pouring the foam into a pipe, also remember that the liquid will coat the inside walls of the pipe and expand thereby clogging the opening on a small diameter pipe. We recommend testing the foam first for this type of application since results can vary on each application. Sure, the most common foams for making decoys are our 4LB and 8LB densities. The actual density you decide on should be based upon your desire for strength(8LB) versus cost savings(4LB). Is there a hazardous fee for shipping? No. These liquids are not considered hazardous and can ship via UPS Ground or Air shipping methods.